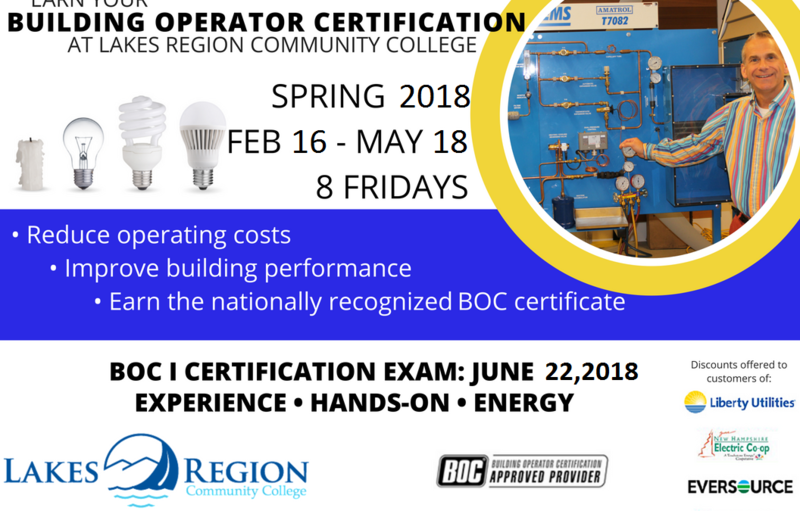 Reduce Facility Energy Costs with BOC I Training at LRCC – Starts this week! Earn Your Building Operator Certification at Lakes Region Community College – Hurry starts this week! Lakes Region Community College is offering its 8-day Building Operator Certification class over 8 Fridays from February 16 through May 18, 2018, with a certification exam on June 22. Large facilities professionals in New Hampshire can learn how to reduce building energy costs; earn the BOC certification; and get a tuition cost-share award from NH’s regulated energy utilities. See the LRCC Energy Calendar for registration details, or contact Andy Duncan, aduncan@ccsnh.edu, tel. 603-366-5329.